© 2015 U. S. Steel Tubular Products. All rights reserved. Discover our line of OCTG Products and Services widely used across the global oil and gas industry. 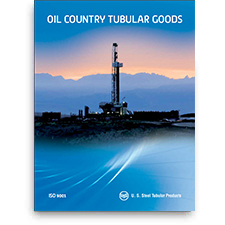 U. S. Steel Tubular Products' oil country tubular goods (OCTG) are specially designed and manufactured to meet the demands of today’s most extreme oil and gas environments. Our OCTG offering includes a broad range of connections, casing and tubing, and accessories, as well as OCTG Premium Services.